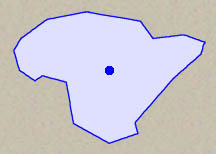 DESCRIPTION: Polygon centroids produced within ArcView (using the “ReturnCenter” request) do not always represent the true center of mass of that polygon. This extension provides a simple way to calculate both the true centroid of a polygon and the ESRI version of the centroid. All or only selected records: You can either use all the polygons in the theme for the analysis or only a selected subset of polygons. If any polygons in your theme are selected, then only those selected polygons will be used to generate the centroids. If no polygons in your theme are selected, then all polygons will be used in the analysis. Projected vs. Unprojected Views: If your original polygons are in Lat/Long coordinates (the Geographic Projection) and your View has been projected, then you have the option of calculating centroids based on either the Geographic projection or your View projection. The choice of projections can dramatically affect the location of the centroids. Output: This extension will generate a point theme representing the polygon centroids. The point theme will contain all the original attribute fields of the original polygon theme. REVISIONS: Version 1.a (December 8, 2004) makes very minor changes to the code, making it run slightly more efficiently and adding X- and Y-coordinates to the centroid attribute table. This version also corrects an error in the Manual equations. Version 1.b (September 28, 2006) fixes an error in which the output shapefiles had two fields labeled “X_Coord” rather than a single “X_Coord” and a single “Y_Coord” field. Jenness, J. 2006. Center of Mass (center_of_mass.avx) extension for ArcView 3.x. Jenness Enterprises. Available at: http://www.jennessent.com/arcview/centermass.htm. Put the extension file “center_of_mass.avx” file into the ArcView extensions directory (../../Av_gis30/Arcview/ext32/). The two Centroid functions can be found at the bottom of the Theme menu in the View menu bar. These menu items will only be enabled if you have a single polygon theme active in your view.